This special lesson program will offer students the opportunity to learn how to ski in both an indoor and outdoor environment. With new and unique learning techniques, this program is a fun and unique way for kids to learn. Rusutsu Resort welcomes the popular animation character Crayon Shinchan to the Ski School! With this Friction program students will learn to ski initially on the indoor slope. This specially designed indoor slope has more friction compared to snow meaning students will feel safe sliding very slowly at first. The indoor slope allows students to improve their balance as they slowly start to slide in a safe learning environment. This unique indoor slope helps everyone feel safe on their skis allowing students to quickly master skiing. Students learn the basics of stance and balance indoors before progressing to the outdoor slope where they learn to stop and turn. *Booking will be accepted from 1st October 2018. Students will learn by using the exclusive Shinchan skis in the lesson. In the Shinchan kids lessons students learn to ski using special Shinchan skis, provided by the school. Students use one of 3 different lengths of ski depending on height weight and ability. The skis have a special shape to help make it easier for everyone to learn how to ski. All students learn by using the special Shinchan skis. Students enjoy a fun warm up with Shinchan. All students learn how to put on their own skis with a little help from their instructors. Students are separated by age with children under the age of 4 using the smaller lesson area and children between the ages 5 to 9 using the longer slope. The friction program uses the artificial indoor slope to allow students to learn to ski in a more controlled environment. This makes it easier for students to control their speed and work on their balance. The debut area features a very short slope which has been specially created for the first timers to learn how to ski on snow. In this area students can have fun learning how practice to stopping in triangle. Once students have grasped how to stop using the triangle the next step is turning. Students can now use the longer slope by taking the snow escalator to the top. This is a great area to master how to turn with the instructor. During the lesson, students will learn by playing. These fun learning methods have been designed specially so help students improve their skiing. As students keep playing they will naturally improve their skiing ability while they are having fun. This lesson has been specially designed for children who have mastered the basics of skiing and are ready for the next challenge. The “Shinchan Tree-run” allows children to ski through a special forest course where students must use skill to avoid fun natural hazards. The Tree-run also contains a special secret area which is waiting to be discovered. The “Shinchan Cross” has bank and wave features, which have been designed to test balance and improve skiing ability. Medal test is available during the Junior Lesson and provided by certified ISIA(International Ski Instructors Association) instructors. The ISIA medal test can be included as part of a Junior Lesson for an additional fee of JPY 2,000 per participant. Participants can receive a variety of different medals, based on technical ability level. The red medal is the highest medal available. Participants who wish to try multiple medal test must purchase additional Junior Lessons. Successful participants are required to pay an additional fee (JPY 1,230) to receive the medal and certification. Please contact the Crayon Shinchan Kids School in advance for more information. Lessons for children between 3 - 12 years old. Lesson fee includes rental equipment (skis, ski boots and helmets) and entrance to Shinchan areas. The program includes indoor lesson and outdoor lesson at debut area or escalator area. 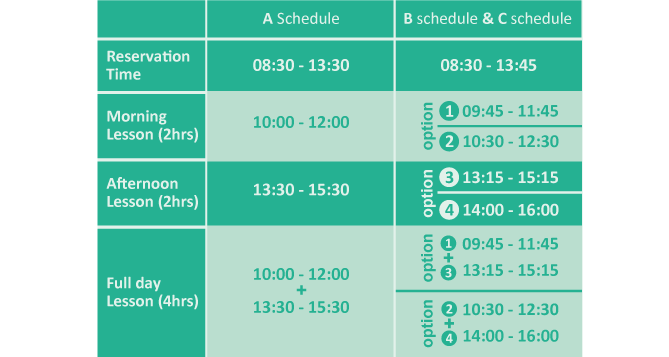 For lesson timetable, please refer to the calendar below. *To view or download the Crayon Shinchan School Calendar (Season 2018-19) in PDF format.